Annual revenues have been growing year after year, and so is the demand for more professionals and more aircrafts. Today, Sideral has 11 Boeing aircrafts in service and with the company in full expansion we will soon start a new phase. The Passenger Transportation. In order to complete the passenger transportation challenge, our company has already begun a market research a few months ago and has also been looking forward to hire new staff and find new service providers. In addition to that, Sideral has already started the homologation process with ANAC(National Civil Aviation Agency) and other local organizations for the new functions that Sideral will have. At the beginning of 2017, we were authorized to be transferred to the area inside the Afonso Pena International Airport in Curitiba, where our Headquarters is located. In the future, we will conclude the construction of our hangar that will be the location of our engineering and maintenance sector in more than 4000m² built. We also have plans to purchase another 10 Boeing 737-400 aircraft. New horizons will always be available to be discovered and Sideral Air Lines follows its work philosophy in pursuit of new achievements, since we believe that: The sky is not the Limit! Sideral Air Lines is a solid company with administrative headquarters in the State of Paraná, South of Brazil. 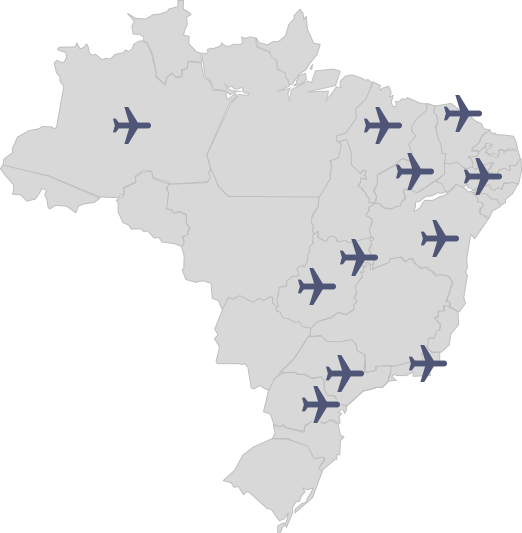 However it also has operational bases in other thirteen states: Amazonas, Piauí, Maranhão, Mato Grosso do Sul, Minas Gerais, Pará, Pernambuco, Ceará, Bahia, Goiás, São Paulo, Rio de Janeiro and the Federal District. Today, it owns 11 boeing aircrafts operating in practically all regions of Brazil. The company also has the collaboration of about 230 professionals, including pilots, ground team, air traffic controllers, maintenance, engineering and administrative staff. Besides that, Sideral works indirectly with a hundred other partner companies, aviation components suppliers and service providers.